Blog hopping and seeing the sea of recipes, I rued myself for not having tried more variety in the basic cake recipes. Though I had made the basic sponge just a few days ago, I was itching to try the same once more, just to know if slight variations would give the same results. I also wanted to test the new strawberry essence I had got from my latest expedition to Nilgiris. I tried this one from Deeba. Preheat the oven to 180 degrees C. Line, grease & dust a Swiss roll tin. Beat the eggs, essence & sugar till mousse like (almost 10 minutes). I added a couple of drops of pink food color. Lightly fold the flour in 3 goes in figure 8 movements (so as no to release the air bubbles). Gently turn into prepared tray & bake for 10-12 minutes till light brown & spongy. I baked the sponge in my regular cake tin as I do not have a Swiss roll tin. The sponge was airy and light. It was ages since I had made Ice Cream cake and it helped that I had some left over Vanilla Ice Cream in the freezer. So it was going to be a Strawberry Cake Ice Cream with chocolate chips. The Ice Cream needs to be kept out of the freezer till it becomes soft. I microwaved mine to hasten the process. Add chocolate chips and mix to distribute them evenly in the ice cream. Slice the cake horizontally into thin layers. Place the loaf tin on the cake layers and cut out slices measuring the bottom and the sides. Don't forget to reserve one slice for the top layer. Keep aside. I find that this works better at a lower freezer setting for atleast 4-5 hours or better still overnight. This helps the dessert set well without making it too hard. Check and remove from the freezer about 10 minutes before serving. Slice with a sharp knife dipped in hot water. Serve immediately. Please Note: If the dessert becomes too hard, remove from the freezer and keep in the fridge till it softens. You could also try microwaving for a few seconds. Try making this with Vanilla sponge and Chocolate Ice cream or Pista Ice Cream and nuts, Pista Cake with Vanilla Ice Cream, Vanilla sponge with coffee ice cream and praline etc. This is my entry to Daisy Blue's "Chef of the Lounge-Summer challenge". Do check out this event, she has some real awesome give aways!! Beautiful and elegant cake..prefect for summer.. Simply cute cake. Looks yummy! Icecream cake looks delicious.Nice pic. I want some...NOW!! This looks perfect Suma. I need to make a wishlist of foods I want you to make for me when I come to Namma Bengaluru. Yum! 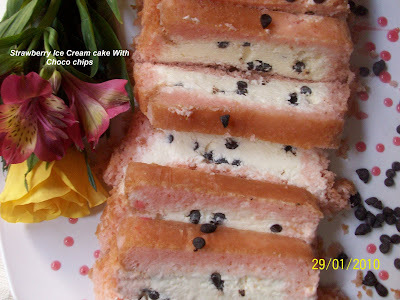 divine icecream cake...your blog is so refreshing...will be back to check out more! Looks yummy, I finished my first baking classes yest and tried making bread which was not a disaster but not perfect too. I hope your blog will help me perfect the art of baking. Just a request, could you post(if u haven;t already) a step-by-step bread making recipe. @Rekha - Great to know u finished ur baking classes. Do share your recipes with us. I am learning baking and have not yet made bread successfully. Hope to learn soon!! Wo lovely ice cream cake!! Perfect for this summer...looks great Suma! Do participate in the green gourmet event hosted by me. 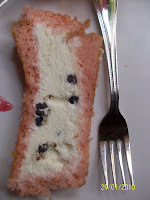 Ice cream cake reminds me of casatta we used to eat as kids. I have never tried my hand at this dessert, this should be great! Yummy! Wow Suma..this is one fantastic post! !Ice-cream Cake looks perfect for the scorching summer heat..I am not a big fan of strawberry flavor so I think,as you suggested,vanilla sponge with chocolate ice-cream would be a delicious combo..:):). 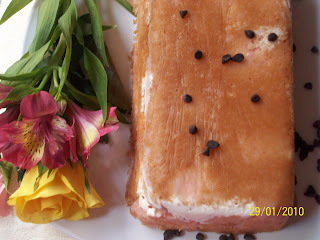 Wooow,,Suma...very nice ice cream cake hmm looks perfect dear everyone will like to have n good for summer. This looks like nirvana! I'm definitely giving this a try with my favourite chocolate flavour, and add more inches to my waistline in the process. Pity, chocolate and ice-cream don't help you lose weight! Institute Of Baking and Cake Art - A Discovery! !